Ideal for histology labs or anywhere a quiet, low-profile cold surface is needed. At just over 2.5 inches high it is scaled down for use at individual microtome stations. The ERGO-900 is built with Peltier technology, which is known for its longevity and low maintenance needs. 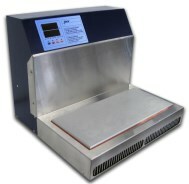 Competing readily with other embedding center cold plates, TECA’s ERGO-900 can uniquely be used either with existing paraffin dispensing centers or with individual sectioning stations. TECA’s Model ERGO-900 is a reliable, virtually maintenance-free Peltier plate which uses a quiet fan and a design optimized for robust performance. There are no threads in TECA Corporation ERGO-900 Cold Plate Reviews at this time.